Community theater can be an excellent way to raise awareness about specific needs of disabled persons or to gain greater participation of local people in a community rehabilitation program. It is also a good method for educating people about important preventive measures. 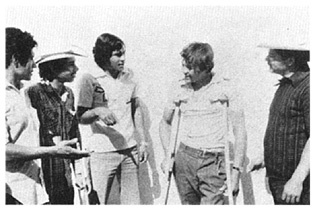 Actors can be disabled persons, parents of disabled children, health workers, rehabilitation workers, schoolchildren, or any combination of these. No special place is needed. However, some sort of raised area is helpful, with a plain wall or curtain behind. But effective popular theater has also been carried out in the street, the village square, and the marketplace. For example,measlesis especially dangerous to poorly nourished children, leaving many with blindness, deafness, fits, retardation, or cerebral palsy. Preventing measles helps prevent disability. 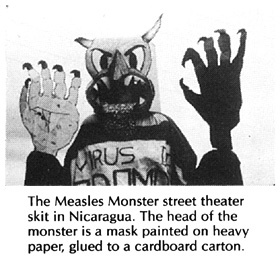 In Nicaragua a group of health workers and local children put on a street theater skit called 'The Measles Monster'. Popular participation is high, for as watchers gather, the monster runs through the crowd looking for unvaccinated children. 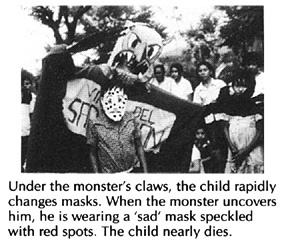 At the end of the skit, when all the children are protected by vaccination, the children in the audience join the children in the skit in beating-up the monster. The announcer of the skit asks the children in the audience why the boy was attacked. They shout back, "Because he wasn't vaccinated." At the end, after all the children are vaccinated, the loudspeaker asks, ''Why can the children now overcome the monster?" They shout back, "Because we have all been vaccinated!" 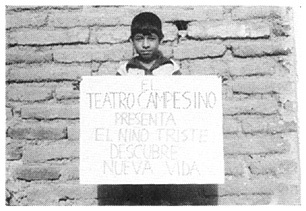 To give another idea of what can be done through popular theater, we will show you photos from 2 theater skits organized by Project PROJIMO, the villager-run rehabilitation program based in Ajoya, Mexico. 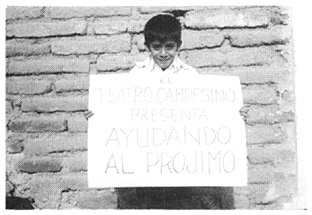 In order to increase community involvement in PROJIMO and to help local people understand its activities better, the program uses popular theater. 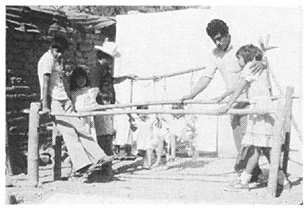 The skits were put on soon after the school children had helped build the rehabilitation playground. 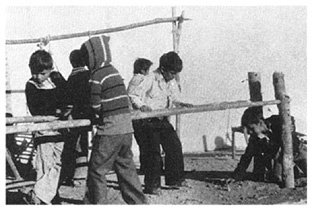 They tell the story of how PROJIMO began and how the playground was built and is used. The actors are local school children, disabled workers of PROJIMO, and village health workers from neighboring villages who were in town for a refresher course. The health workers' participation in the skits gave them experience working with disabled persons, and also gave them ideas for simple rehabilitation activities and aids in their own villages. 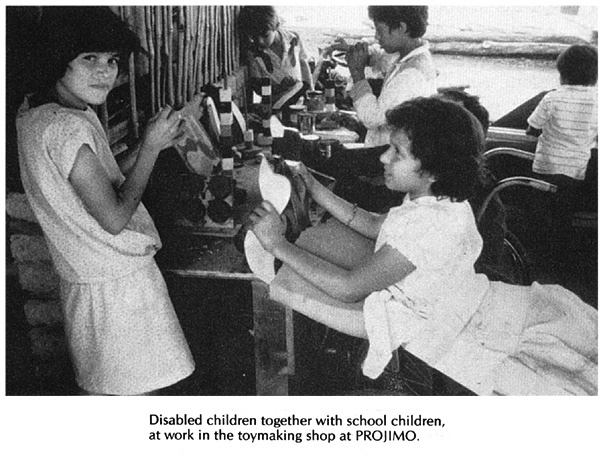 - the story of how Project PROJIMO got started and how village school children built a playground for disabled and non-disabled children. 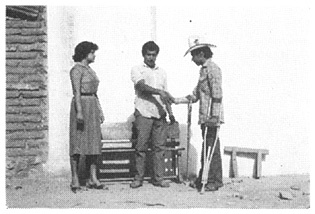 A disabled young man (played by Marcelo, see Page 76) arrives at Ajoya and asks directions to the village health center (Project Piaxtla). 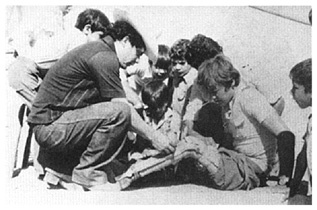 The health workers examine him, find he is disabled by polio and think he may need braces. But they lack the knowledge about what to do for him. So they send him away without helping him. The health workers are concerned: "So many disabled children come to us. Most of them don't need hospitalization or surgery, but simpler things like braces or special exercises. Yet we don't have the knowledge or skills to provide these things for them. Why don't we try to get more training and start a rehabilitation program for disabled children here in our village? We can focus on what parents can do for their children in the home." The health workers meet with villagers to discuss the new program. The villagers respond enthusiastically. Men offer to help fix up the center. 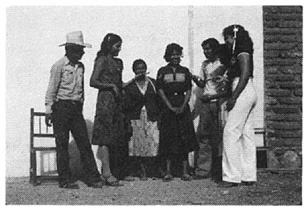 Women offer to provide room and food for visiting children and their families. 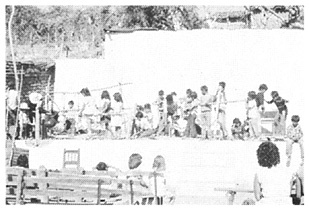 And the schoolchildren offer to help build a rehabilitation playground-on condition that they can play there too. 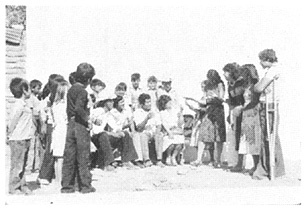 The schoolchildren-who had already built the actual 'playground for all children' in the village- uickly rebuild the playground on stage. 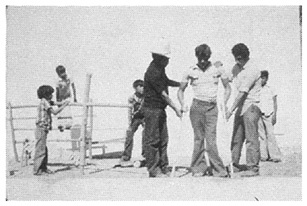 Because they had already dug the holes for the poles, and had practiced over and over again, they were able to set up the playground on stage in about 3 minutes. 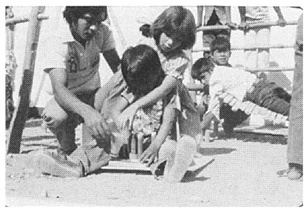 In this way villagers have a chance to see how different equipment in the playground is used -like this 'rocker board' to help children with balance problems, and the sitting frame to help a child with spasticity keep his legs apart while he plays with homemade educational toys. The second skit is a continuation of the first. This is the disabled child, Tristín. 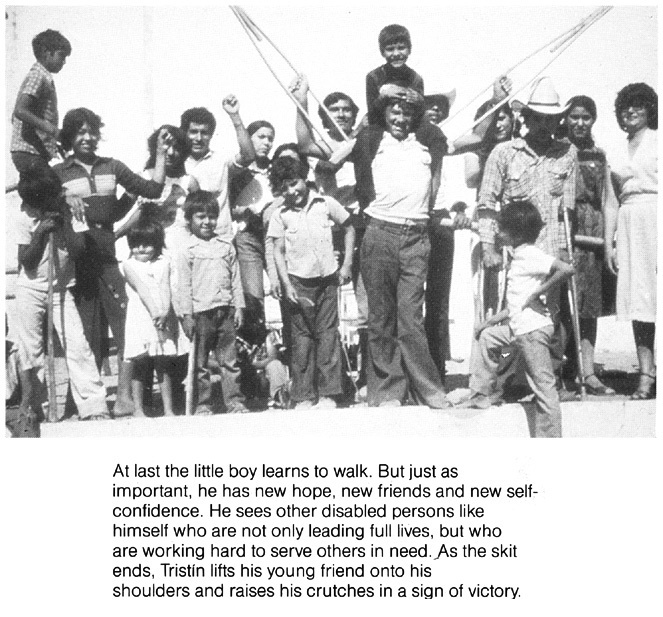 His role is played by lnés-one of the disabled village workers. 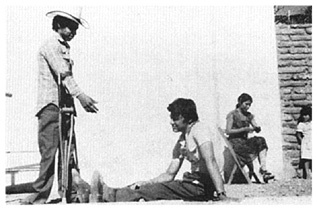 In fact, the skit comes close to telling lnés' own story. 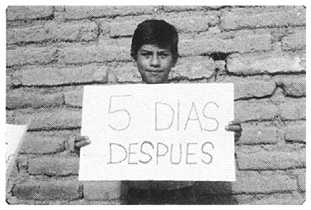 Like Tristín in the skit, lnés is an orphan disabled by polio who was helped by PROJIMO to get braces, and then stayed on as a rehabilitation worker. 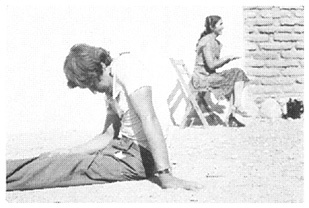 Marcelo, a village rehabilitation worker, finds Tristín in a village hut. The boy is unhappy because he cannot walk and has no friends. Marcelo invites Tristín to come with him to PROJIMO. 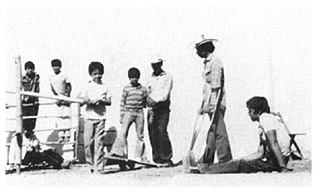 They arrive at PROJIMO, and Marcelo shows Tristín the playground. Tristin (and the audience) have a chance to see how the playground equipment is used to help disabled children learn to walk and do other things. 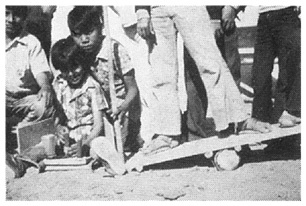 They see how the sitting frame and homemade games are used; also how a child who cannot sit lies on a sloping platform so he can lift his head and use his hands. The village rehabilitation workers have made a brace for Tristín, and here fit it onto his leg. 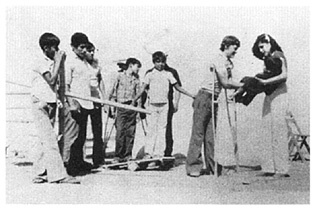 Then they help him learn to walk with the brace, using the parallel bars. Tristín learns quickly and soon begins to walk with crutches. 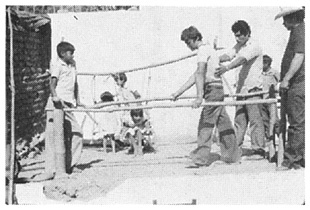 The time comes when PROJIMO has done as much as it can for Tristín, in terms of physical rehabilitation. "Where do you go from here?" they ask him. "I don't know," he answers. "I have no family to go to. I've never gone to school. Work is hard to get even for the physically fit." "Why don't you stay with us and help in the rehab program? You can learn some skills and help other children like yourself." 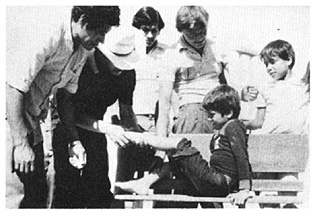 Together the team examines the child, who appears to have cerebral palsy affecting mainly his legs. The team believes he has a good chance of learning to walk. 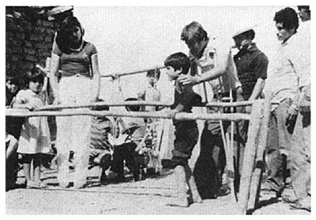 Tristin shows the child's mother how she can help him learn to walk using the parallel bars. 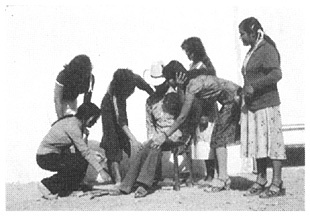 The ending of this skit was even more impressive for the village audience because they had seen lnés (who acted as Tristín) when he first came to their village. 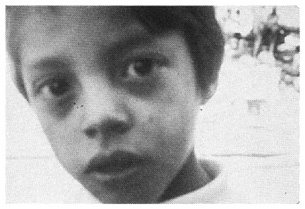 They knew that his transformation from a very disabled, withdrawn youth to a fast-moving, capable young man was not just acted-it was real. And because PROJIMO is the village's program, everyone felt proud. 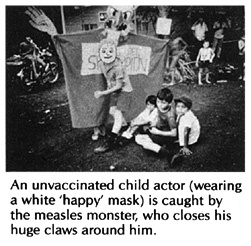 Sets of color slides (transparencies) with written scripts of the skits "The Measles Monster," ''Helping Your Neighbor," and "A Disabled Child Discovers New Life," are available from the Hesperian Foundation. Also available, although less directly related to disability prevention, are slide sets "The Importance of Breast Feeding," "Useless Medicines That Sometimes Kill,'' "The Women Unite To Overcome Drunkenness,'' and "Farmworkers Unite To Overcome Exploitation." Other skits are mentioned in this book on Page 443 and 445.